Thanks to generations of “Road Runner” cartoons, the name “Acme” has become synonymous with “generic.” Which is a good way to describe the AcmeLists app for the iPhone—solid, dependable, a little anonymous. This $1 effort from Acme Technologies does everything you’d expect a list-making app to do, but it doesn’t surprise you with any astounding extras. Getting Started: AcmeLists is pretty easy to use, but the app still does a good job at providing instructions on making and managing your to-do lists. 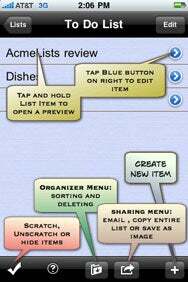 Creating and organizing to-do lists in this app is pretty easy—but AcmeLists does a good job of providing instructions to guide less-savvy users through the process. You can order your lists alphabetically or backward, or you can tap Edit and use a couple of quick thumb swipes to arrange your list according to your personal priorities. The app also lets you mail the list to others or save a photo of a list to your library. All very solid features. But AcmeLists would be even more useful with a couple of tweaks. It’s nice to arrange a list in order of priority, but a Remember The Milk-style coding system of “very important” to “not so important” would be even more helpful. And all list-making apps should really offer a way to syncronize important items with your electronic calendar. Those are minor complaints, however. AcmeLists is helpful and easy to use—and unlike those old cartoons, the app will never blow up in your face.